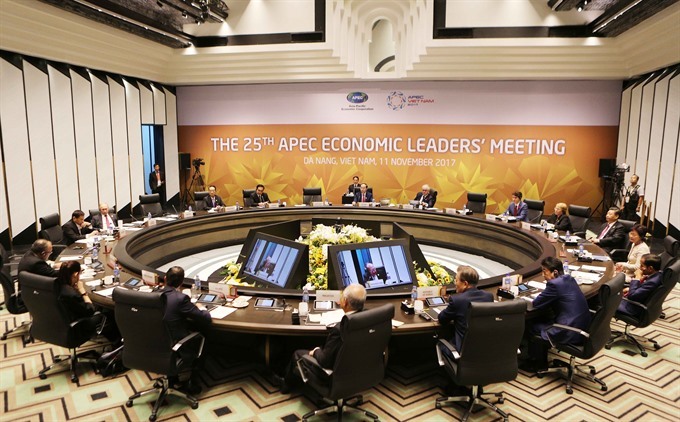 ĐÀ NẴNG – The APEC 2017 Economic Leaders’ Meeting ended on Saturday with leaders of 21 member economies adopting the Đà Nẵng Declaration that reiterated their commitment to multilateral trade that fosters inclusive growth and reaffirmed their confidence in the forum’s ability to tackle future challenges together. 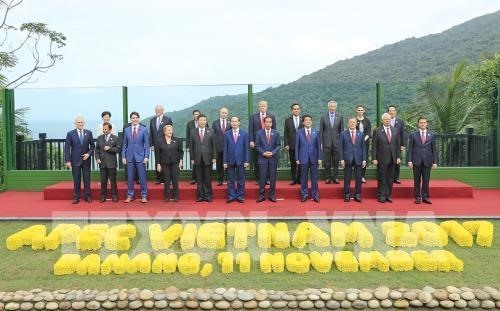 President Trần Đại Quang, who chaired the meeting, said the declaration, coming at the conclusion of the summit themed Creating New Dynamism, Fostering a Shared Future, reaffirmed leaders’ long-standing commitment to APEC’s mission of fostering sustainable economic growth and prosperity in the Asia-Pacific region. The document was adopted with high consensus, President Quang told local and foreign media at a press briefing. “This is the most important outcome of the summit as well as the APEC Year 2017,” he said. Recognising the significant challenges the region’s economies face, the leaders pledged to work together and take the following actions: promote innovative, inclusive growth; sustainable employment; create new drivers for regional economic integration, strengthen the capacity and innovation of micro, small and medium enterprises; enhance food security and sustainable agriculture in response to climate change; and foster a shared future. During the meeting’s two discussion sessions, the leaders agreed that in order to improve growth quality, competitiveness and productivity of member economies, it was imperative that APEC member countries reinforce the quality of education and equip regional workers with skills to better adapt to the employment environment and labour market, which are undergoing significant changes due to the fourth industrial revolution. “We have adopted a framework for the development of human resources in the digital age,” the President said. He noted that with the aim of generating new dynamisms for sustainable and inclusive growth, the meeting spent a substantial amount of time discussing strategic measures to develop micro, small and medium enterprises in a green, sustainable and innovative manner; promote starts-up and supporting industries; develop sustainable agriculture in response to climate change; strengthen food, water, and energy security; enhance structural reform and capacity; mitigate natural disaster risks; increase women’s economic empowerment and promote sustainable tourism development. The leaders agreed that promoting free and open trade and investment, and fostering regional linkages and connectivity is a mission that members will continue, contributing to maintaining APEC as a driver of global economic growth and connectivity, he said. “The leaders emphasised the role of APEC in backing a law-based, free, open, fair, transparent and inclusive multilateral trade system” he said. The meeting applauded cross-border e-commerce that creates conditions for APEC to effectively tap the potential for developing the Internet/digital economy as well as global supply and value chains. President Quang said APEC was doing its utmost to achieve Bogor Goals by 2020 and prepare for its fourth decade of development. The decision also reflects the determination of member economies to build an Asia-Pacific community of peace, stability, dynamism, cohesion and prosperity, with people and businesses at its heart, he stressed. Việt Nam became a member of the APEC community in 1998, and has since hosted the APEC Year twice in 2006 and 2017.